The modern version is paying tribute to Ariel's mermaid silhouette, this romantic gown features re-embroidered lace and taffeta fabrics that move as gracefully as the ocean. Touches of sea-inspired details such as pearl beading, subtle metallic accents, crystal beading and sequins add a splash of the unexpected. I think that embroidery and especially skirt part of this dress is amazing! If you have hourglass body, this will look stunning on you ! 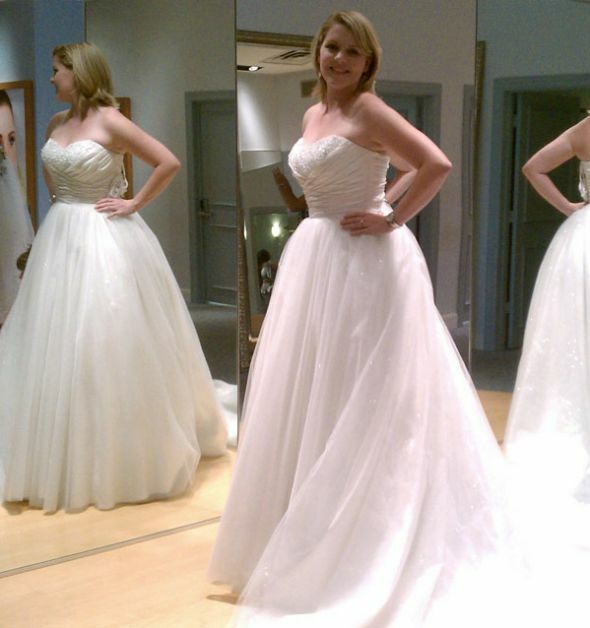 Stylish sophistication with a ballgown inspired by a single dance. This gown features a draped satin and crystal beaded corset with subtle hints of gold metallic embroidery. A detachable shrug and draped net pick-up skirt create added grandeur. 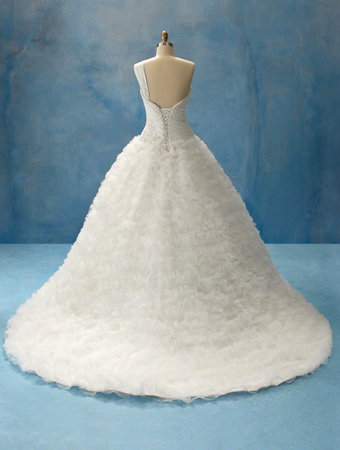 Classic ballgown of tulle and glitter net over taffeta, inspired by Cinderella's glass slipper. The draped criss-cross bodice features a romantic sweetheart neckline accented with sparkling crystal beading and rhinestones. 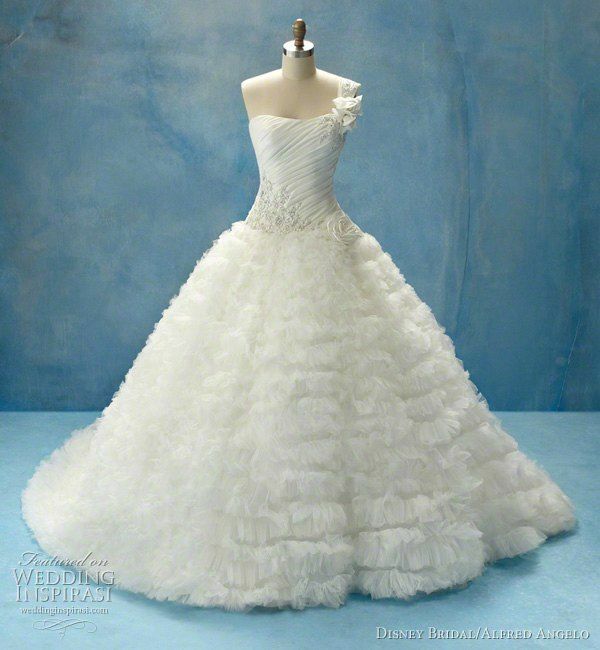 This truly stunning one-shoulder taffeta ball gown features dramatic ruched pick-ups, inspired by the grace of the water lily. 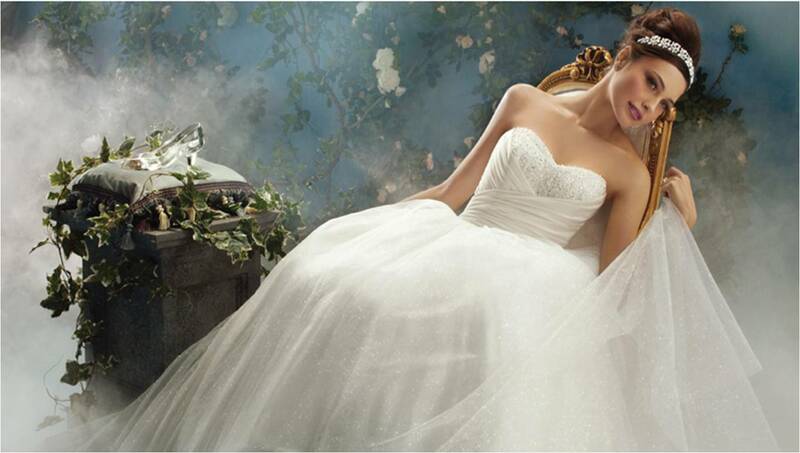 The asymmetric draped bodice is embellished with beautiful beaded flowers, metallic embroidery and pearl accents. This romantic taffeta gown featuring multiple layers of dreamy gossamer tulle, reminiscent of cascading briar rose petals. 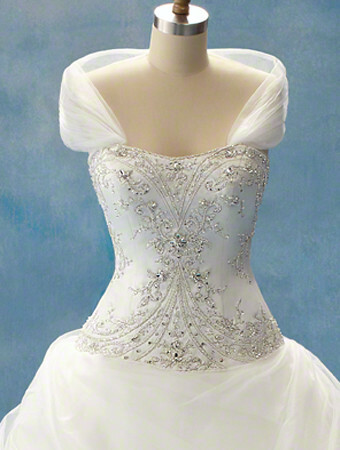 The re-embroidered lace and crystal beaded bodice with rose detail adds an elegant touch. Featuring flowing, soft shimmer satin and a micro-ruched bodice, the bejeweled neckline and halter strap with encrusted pearls, rhinestones and crystal beading add a touch of wanderlust. 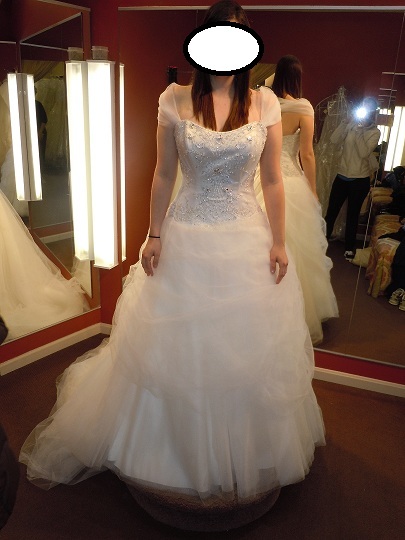 Unfortunately i couldn't find a photo of a real bride trying this dress on. 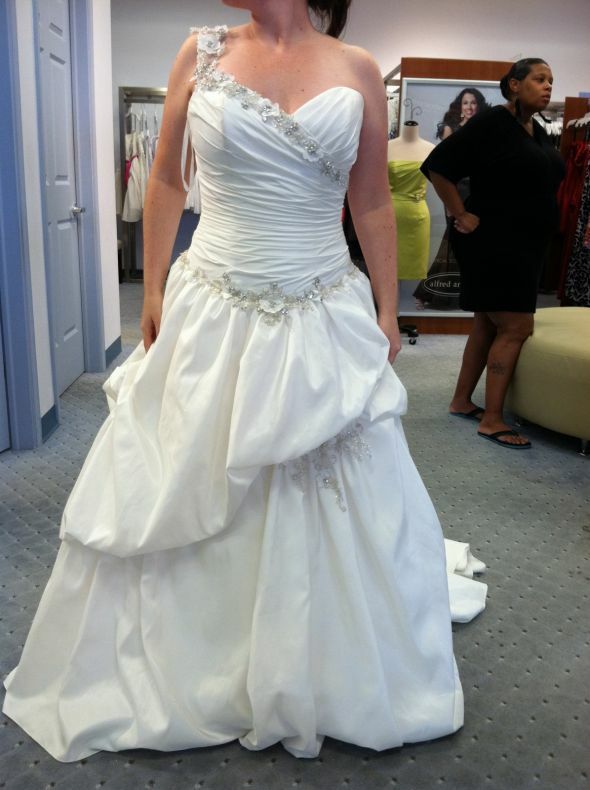 I am guessing, that this type of a dress asking a lot from the bride's figure and not many would be confident enough to wear something like this on their wedding day. 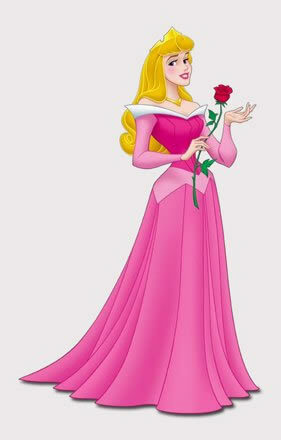 Though the dress does look beautiful. 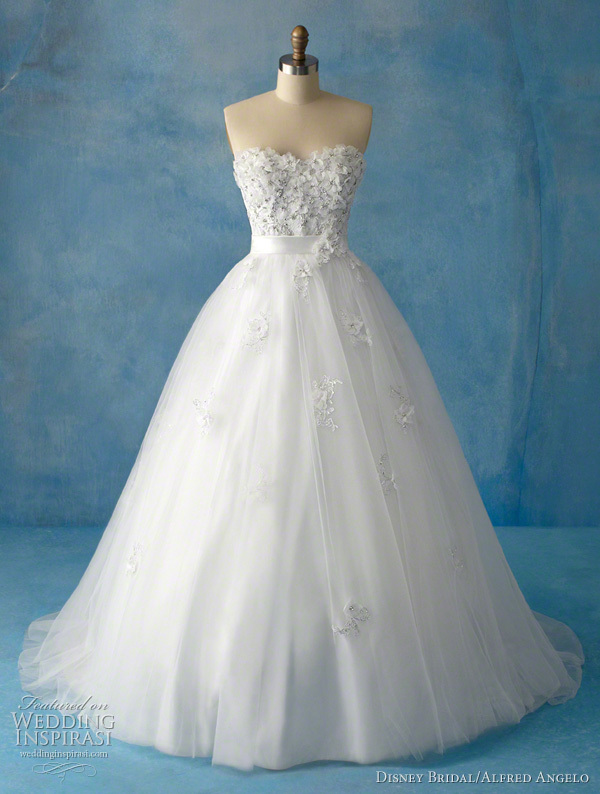 This net-over-satin ball gown features a lace bodice of organza apple blossoms with shimmering rhinestone and crystal centers and a skirt with scattered blossom detail. A lovely satin sash and back bow make a graceful finish. 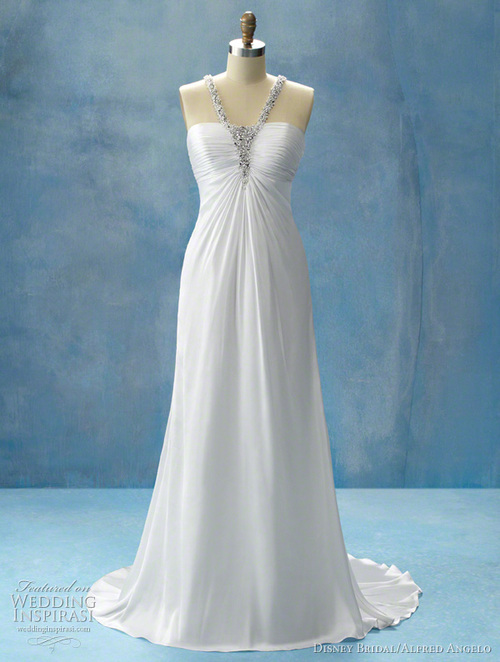 The gown features a one shoulder dropped waist and pleated bodice. Delicate three-dimensional satin petals and light catching sequins and crystals dance and float like the lanterns that carried her dreams. Rapunzel at the bridal show. 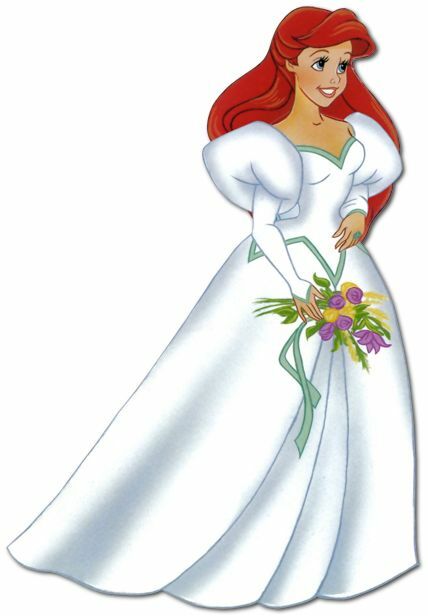 Hope you enjoyed looking at this Disney inspired wedding dresses. 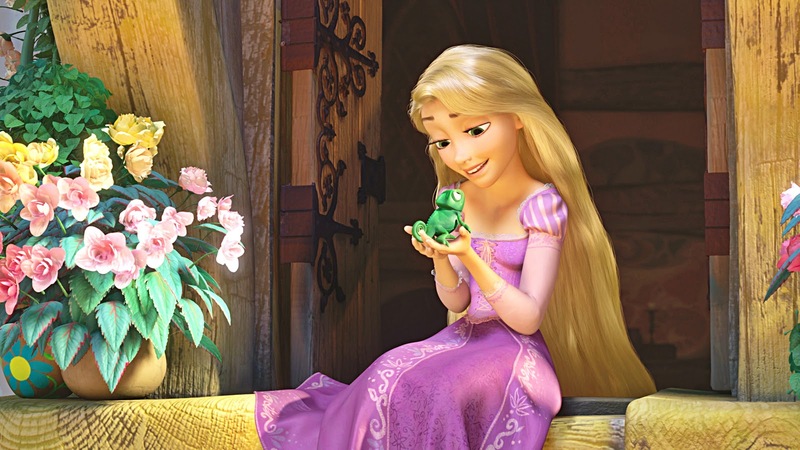 This are not the only ones that you can find, but to me this ones had the interesting and unique touches that fit to each princess. Wow!!! 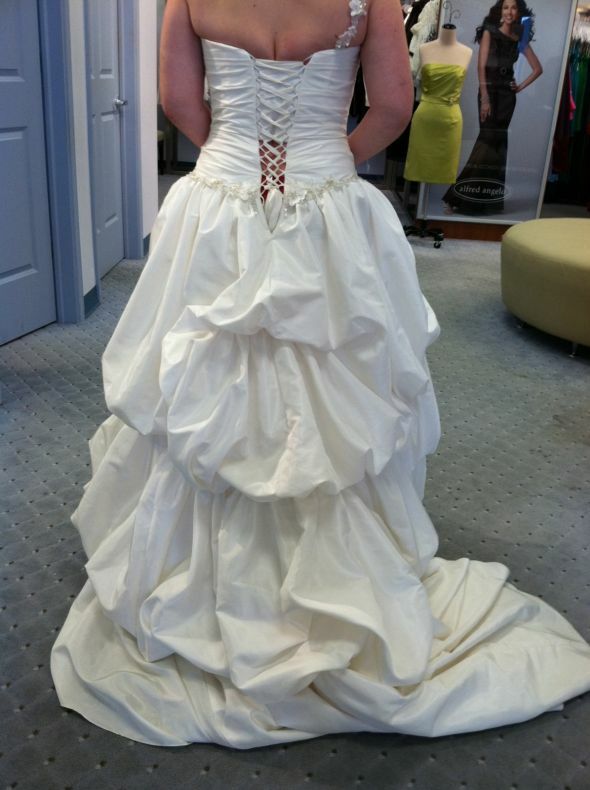 Amazing wedding blog site for a awesome wedding dresses. 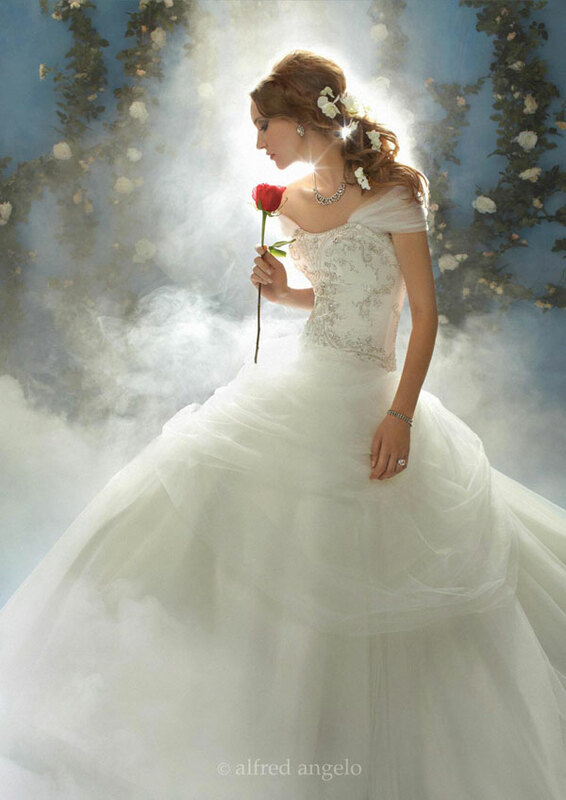 I like and love all the photos of dresses. Each and everyone have unique to lucky for who going to be wear in our wedding day. 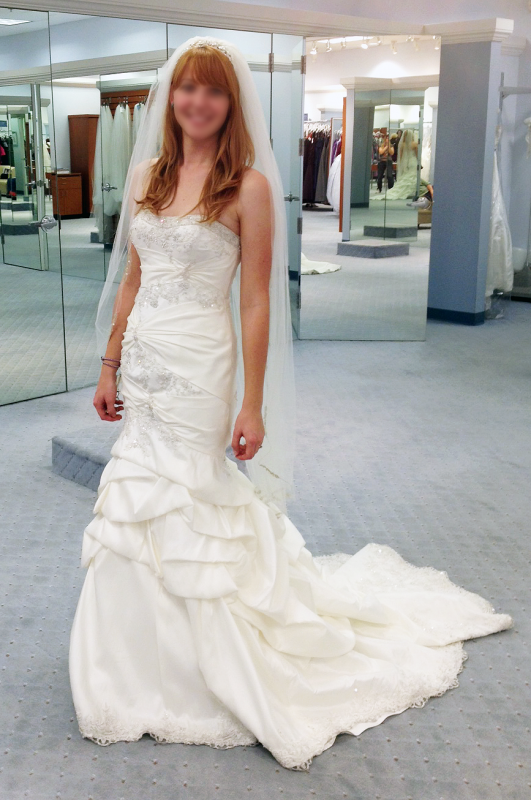 I followed you here from long hair community:) I love the choices you made in wedding dresses. These Bridal dresses so hot and pretty. Fashionable too. These are superb and fabulous. Stunning also. Everybody should like this trend. 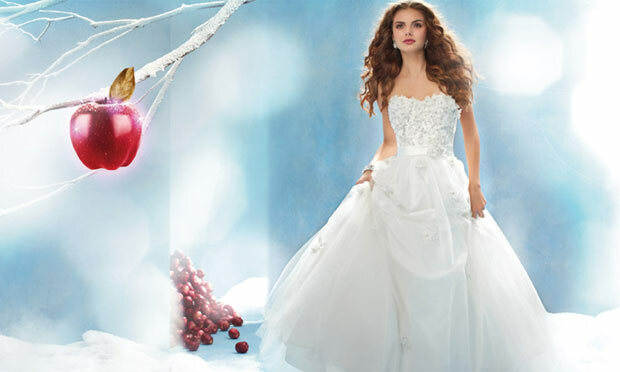 If you want to find out your favorite one for winter fashion , wedding and bridal dresses and accessories then seek your choice from boutiqueken, provides standard fashionable dresses and accessories for men, women and kids. Choose your one from this huge collection. Just visit this page and search.Ensuring your satisfaction.